Conan O’Brien says he would have left NBC rather than do what Jay Leno did to him, in his first interview since being forced off the Tonight Show. 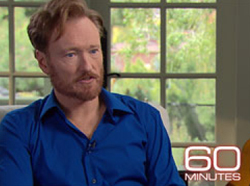 O’Brien’s interview with “60 Minutes” correspondent Steve Kroft will be broadcast this Sunday, May 2, at 7 p.m. ET/PT. “He went and took that show back and I think in a similar situation, if roles had been reversed, I know…I know me, I wouldn’t have done that,” O’Brien says. “If I had surrendered The Tonight Show and handed it over to somebody publicly and wished them well and then…six months later. But that’s me, you know. Everyone’s got their own, you know, way of doing things,” he tells Kroft.